The origin of the Shire breed is lost in the mists of antiquity, as is the case with many breeds, but we do have a pretty fair notion from whence he cometh. Sir Walter Gilbey, an early authority on the breed, had this to say on the introduction to Volume 1 of the stud book. "The Shire horse is the purest survival of an early type which was spoken of by medieval writers as the 'Great Horse.' 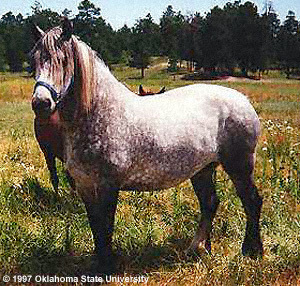 If this horse did not originate in England, this country at a very early date acquired a widespread reputation for producing it. Indeed, the English 'Great Horse' seems to have been a native development of that British 'War Horse' whose strength, courage and aptitude for discipline are spoken of in high terms by the -chroniclers of the Roman legions at their first landing upon these shores. "There are good reasons for believing that in the English Great Horse, modern Shire horses were originated. It really seems to be true that the most powerful animals now existing in England, for the advance of agriculture and commerce, (i.e., the arts of peace) are the direct descendants of the horse which, when Julius Caesar arrived here, attracted his attention for its efficiency in the assistance which it rendered to our forefathers in the pursuits of war." The destiny of the Shire and of England is inexorably entwined. In the period between the reign of Henry II, 1154, and that of Elizabeth (commencing in 1558) it seems to have been a constant aim of the government to increase the size and number of horses called "The Great Horse." Little wonder, the weight of many horse soldiers in armor was upwards to 400 lbs. for rider and armor. During the reign of King John, from 1199 to 1216, we have particulars of the importation into England from the lowlands of Flanders, Holland, and the banks of the Elbe, of a hundred stallions of large stature; and it is from that blending some 800 years ago, of these animals with the English breed that some strains, at least, of England's heavy horses must date their origin. Another writer describes these Flemish horses as being for the most part black, with white markings on face and feet, and frequently with all his legs white up to the knees and hocks. He was tall, rangy, muscular, well developed at the vital points, and stood on broad, flat, cordy limbs which were strongly jointed both above and below, and the backs of which were heavily fringed with long hair from the fetlocks to the upper end of the cannon. During the reign of Henry VIII, from 1509 to 1547, special attention was directed to the raising and breeding of strong horses, and several laws were passed with that in mind. Acts were passed in 1535 and 1541 forbidding the use for breeding of horses under 15 hands in height, also prohibiting all exportation, even into Scotland. War then is the ancient heritage and role of the Shires. But if he was useful in war, he proved to be even more so in peace. Turning his attention from battle to commerce and agriculture in a nation that takes both very seriously indeed, the Shire became nothing less than a national treasure in the 1800s. Big Shire geldings moved the commerce of this most commercial of all nations off the docks and through the streets of her cities. Over badly paved streets and on rough roads, weight was opposed by weight. There was a dependable and extensive demand, decade after decade, for massive horses with great muscular strength. Both qualities were necessary to enable them to move the commerce of this nation. It was the sort of situation that called for the breeder's skills, and the English have never been lacking in that respect. Whatever type of domestic animal they have need they have developed. And so it was with this breed of horse. 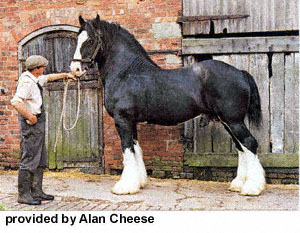 The needs of empire and the temper of the times called for a horse of enormous bulk, prodigious muscular strength, and docility ... and the stockmen and farmers of England responded with one of their finest living creations-the Shire horse. The marshy fen counties of Lincolnshire and Cambridgeshire lay claim to having exerted the earliest beneficial influence upon the breed and it was from these counties that sales were first made for the improvement of draft horses all over England. Leicestershire, Staffordshire, and Derbyshire were the first to benefit from these counties, and thus the Shire slowly spread over virtually the whole of England. There were differences. The Shires coming out of their historic home, the fenlands of Lincolnshire and Cambridgeshire, tended to have more bone and hair than those of their neighbors. Yorkshire and Lancashire, for instance, were noted for horses of a finer texture and more endurance. The rugged demands of the Liverpool market, where thousands of stout geldings were used, certainly contributed to correct type, and soundness, and great strength in the case of northern breeders-as London did to the south. An American horseman from that period, a dealer in several breeds and an acknowledged expert, had this to say about the Shire. "I have had opportunity for extended personal observations and inquiry as to the result of crossing them on native American mares, as well as on the grades and crosses of other breeds, and the evidence is of unqualified satisfaction. They have been found competent to transmit and impress their own characteristics with remarkable certainty, and the name "Shire Horse" had become a synonym for strength, constitution, energy, and endurance. "